William Orville Douglas (16 October 1898 – 19 January 1980) was an Associate Justice of the Supreme Court of the United States. With a term lasting 36 years and 209 days, he is the longest-serving justice in the history of the Supreme Court. We have here the problem of bigness. Its lesson should by now have been burned into our memory by Brandeis. The Curse of Bigness' shows how size can become a menace – both industrial and social. It can be an industrial menace because it creates gross inequalities against existing or putative competitors. It can be a social menace – because of its control of prices. Control of prices in the steel industry is powerful leverage on our economy. For the price of steel determines the price of hundreds of other articles. Our price level determines in large measure whether we have prosperity or depression – an economy of abundance or scarcity. Size in steel should therefore be jealously watched. In final analysis, size in steel is the measure of the power of a handful of men over our economy. That power can be utilized with lightning speed. It can be benign or it can be dangerous. The philosophy of the Sherman Act is that it should not exist. For all power tends to develop into a government in itself. Power that controls the economy should be in the hands of elected representatives of the people, not in the hands of an industrial oligarchy. Industrial power should be decentralized. It should be scattered into many hands so that the fortunes of the people will not be dependent on the whim or caprice, the political prejudices, the emotional stability of a few self-appointed men. The fact that they are not vicious men but respectable and social minded is irrelevant. That is the philosophy and the command of the Sherman Act. It is founded on a theory of hostility to the concentration in private hands of power so great that only a government of the people should have it. A function of free speech under our system of government is to invite dispute. It may indeed best serve its high purposes when it induces a condition of unrest, creates dissatisfaction with conditions as they are, or even stirs people to anger. Speech is often provocative and challenging. It may strike at prejudices and preconceptions and have profound unsettling effects as it presses for acceptance of an idea. All executive power – from the reign of ancient kings to the rule of modern dictators – has the outward appearance of efficiency. Free speech is not to be regulated like diseased cattle and impure butter. The audience … that hissed yesterday may applaud today, even for the same performance. That seems to us to be the common sense of the matter; and common sense often makes good law. The conception of political equality from the Declaration of Independence, to Lincoln's Gettysburg Address, to the Fifteenth, Seventeenth, and Nineteenth Amendments could mean only one thing — one person, one vote. Often referred to as Douglas' "trees have standing" case. Inanimate objects are sometimes parties in litigation. A ship has a legal personality, a fiction found useful for maritime purposes. The corporation sole – a creature of ecclesiastical law – is an acceptable adversary and large fortunes ride on its cases....So it should be as respects valleys, alpine meadows, rivers, lakes, estuaries, beaches, ridges, groves of trees, swampland, or even air that feels the destructive pressures of modern technology and modern life. The river, for example, is the living symbol of all the life it sustains or nourishes – fish, aquatic insects, water ouzels, otter, fisher, deer, elk, bear, and all other animals, including man, who are dependent on it or who enjoy it for its sight, its sound, or its life. The river as plaintiff speaks for the ecological unit of life that is part of it." He was, however, speaking to a representative of government, the police. And it is to government that one goes 'for a redress of grievances,' to use an almost forgotten phrase of the First Amendment. But it is said that the purpose was 'to cause inconvenience and annoyance.' Since when have we Americans been expected to bow submissively to authority and speak with awe and reverence to those who represent us? The constitutional theory is that we the people are the sovereigns, the state and federal officials only our agents. We who have the final word can speak softly or angrily. We can seek to challenge and annoy, as we need not stay docile and quiet. When man was first in the jungle, he took care of himself. When he entered a societal group, controls were necessarily imposed. But our society -- unlike most in the world -- presupposes that freedom and liberty are in a frame of reference that makes the individual, not government, the keeper of his tastes, beliefs, and ideas. That is the philosophy of the First Amendment; and it is the article of faith that sets us apart from most nations in the world. For there is no constitutional right for any race to be preferred... If discrimination based on race is constitutionally permissible when those who hold the reins can come up with "compelling" reasons to justify it, then constitutional guarantees acquire an accordion-like quality. One aspect of modern life which has gone far to stifle men is the rapid growth of tremendous corporations. Enormous spiritual sacrifices are made in the transformation of shopkeepers into employees... The disappearance of free enterprise has led to a submergence of the individual in the impersonal corporation in much the same manner as he has been submerged in the state in other lands. Speech at annual dinner of Fordham University Alumni Association, New York City (February 9, 1939), reported in James Allen, Democracy and Finance (1940, reprinted 1969), p. 291. This was Douglas's last speech as chairman of the Securities and Exchange Commission before his appointment to the Supreme Court. "The Dissent: A Safeguard of Democracy," 32 Journal of the American Judicial Society 104, 105 (1948). These days I see America identified more and more with material things, less and less with spiritual standards. These days I see America acting abroad as an arrogant, selfish, greedy nation interested only in guns and dollars, not in people and their hopes and aspirations. We need a faith that dedicates us to something bigger and more important than ourselves or our possessions. Only if we have that faith will we be able to guide the destiny of nations in this the most critical period of world history. [One of the] two completely evil men I have ever met. Oyez project, U.S. Supreme Court media on William O. Douglas. 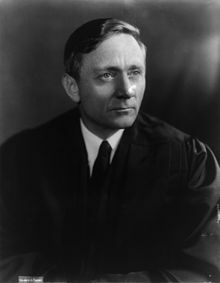 Supreme Court Historical Society, William O. Douglas. This page was last edited on 17 April 2019, at 20:04.